Uroboros has introduced exciting new "Reactive Red" Transparent and Opal to the ever-expanding System 96 line. Chemistry in these glasses causes a reaction with copper, a colorant in many Blue and Green glasses. 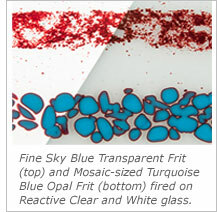 When a glass containing copper is fired on Reactive glass, a reddish color is produced, showing as a rim on the Opal Turquoise glass (lower right) but a complete transformation from Sky Blue to red (upper right).